I always liked off the beaten track places, places where not everybody goes. 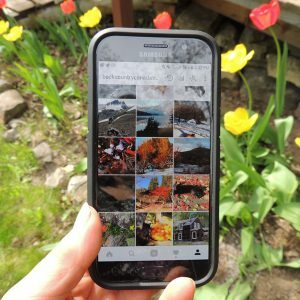 Since travelling has become available almost to everyone and many awesome travel destinations are packed with tourists, I started to look closer to home. With Canada as my home, I don’t have to go halfway around the world to experience wilderness, culture and natural beauty at its best. The Yukon and Northwest Territories are paradise for gravel travel the lonely, northern roads. From my 8,500 km northern road trip this summer, I truly enjoyed 2,200 km gravel travel the most. The famous Alaska Highway is the main route to the North. It winds through historic communities, Kluane National Park and through Yukon’s capital of Whitehorse. You don’t need a 4WD to travel the Alaska Highway and it’s perfect for road trippers travelling with campers and RVs. If you are like me and you want to travel the gravel travel highways, a 4WD is a must. In addition, you should carry two spare tires and an extra gasoline. You need to be prepared for any of the gravel travel highways I mention in this blog. Check out Wilderness Road Trip Planner for extra tips. First of all, I had to change my perception of the word Highway. All highways in this article are gravel roads. The experience you will have driving any of them depends a lot on the weather. Potholes are normal but much easier to deal with when the road is dry. My main concern was the mud and I had lots of it because of heavy rain. If you are adventurous and prepared for gravel travel, don’t miss out on an experience of a lifetime. 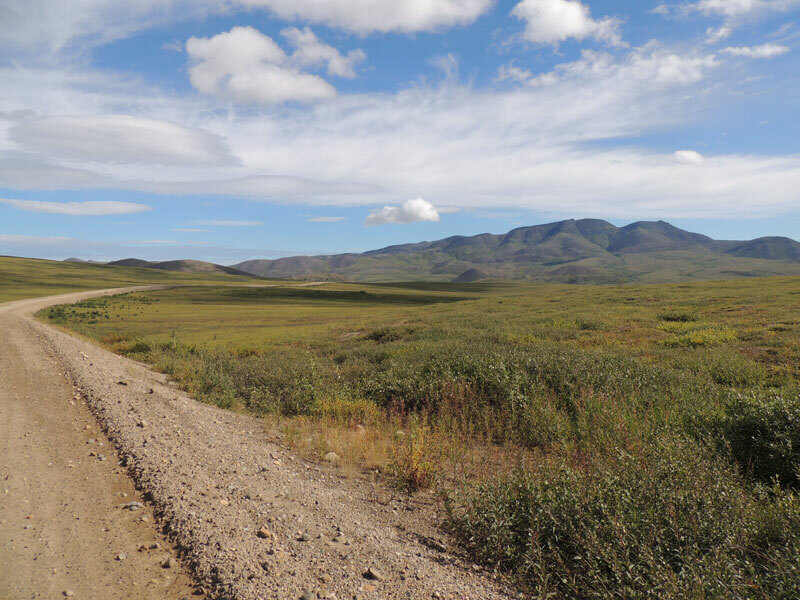 Probably Canada’s best-known road for overland gravel travel is the Dempster Highway. This 736 km thrill ride is one of North America’s great adventure roads, winding through mountains and valleys, across the tundra and boreal forest. The Dempster (Highway 5 in the Yukon, Highway 8 in the NWT) starts 40 km south-east of Dawson City off the Klondike Highway. The road leads north over the Ogilvie and Richardson mountains beyond the Arctic Circle and ends in Inuvik in the Northwest Territories near the shores of the Beaufort Sea. The Highway is built on a thick base of gravel to insulate the permafrost underneath. This protects the road from melting. The Dempster is open most of the year, but the best time to travel gravel is between June and early September when the ferries over the Peel and Mackenzie Rivers operate. According to locals, the highway is smoother and easier to travel in winter. Be prepared for cold weather and check road conditions before proceeding in winter. Look out for herds of caribou mid-September to late October and March and April. The Dempster Highway is not a road for the faint-hearted! Be prepared for the trip. I suggest visiting the Western Arctic Visitor Centre in Dawson City for up-to-date information on the Dempster Highway before heading out. Inuvik also has a Tourist Information Centre and the friendly staff can give you information about road conditions, as well as the best way to travel to Tuktoyaktuk or any other Arctic town. 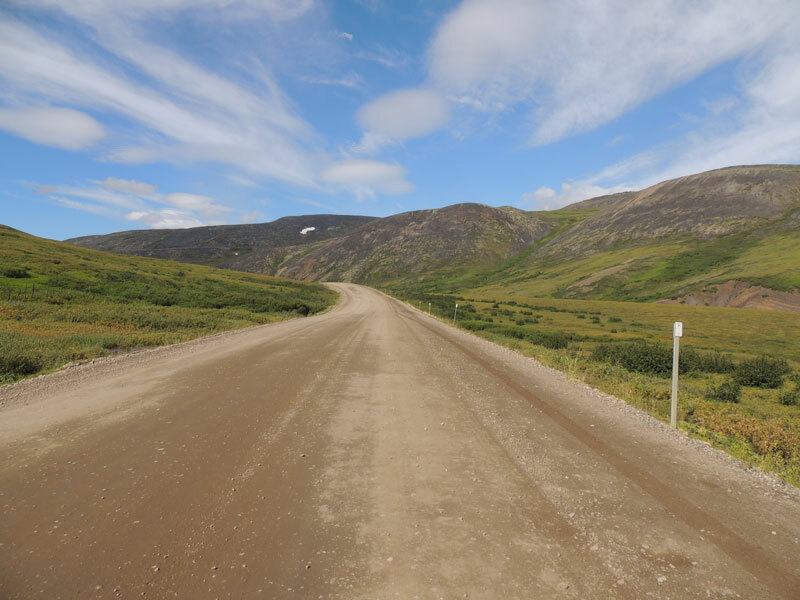 More detailed information about gravel travel the Dempster Highway you find in my Article Dempster Highway: Roadtrip To The Arctic. 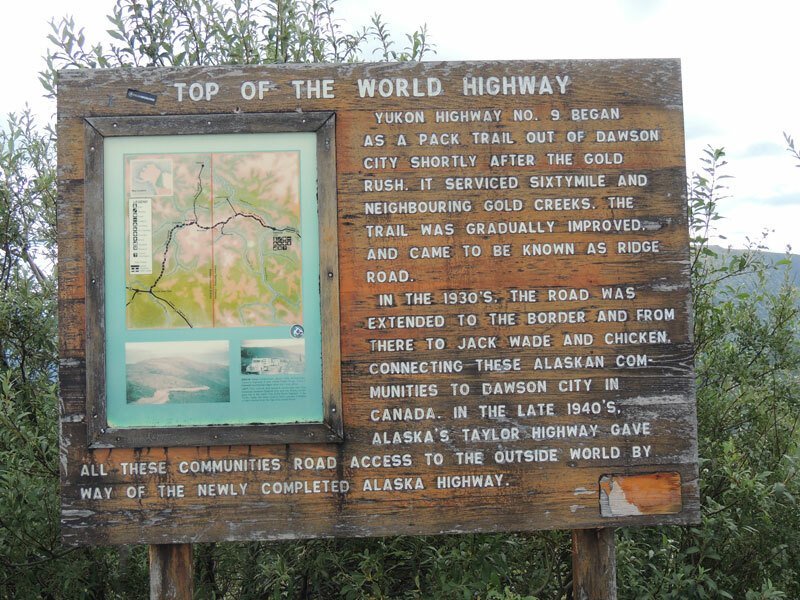 Top of the World Highway (Yukon Highway 9) connects Dawson City with the Taylor Highway (Alaska Highway 5). The adventure starts with crossing the Yukon River on the George Black ferry from Dawson City. The ferry operates from about mid-May to the second or third week in October. Stay at the Yukon Territorial Government Campground on the West side of Dawson across the river to get a head start in the morning. Having survived the Dempster Highway a couple of days earlier I wasn’t sure what to expect when I packed my dripping wet tent at the Yukon River YTG campground in Dawson City after a night of heavy rain. I could see a blue streak in the sky and decided to stick to my plan and to head for Chicken Alaska. Top of the World Highway lives up to its name. The amazing route climbs quickly from the west bank of the Yukon River. The road winds above timberline for many kilometres and the views are spectacular. The road wasn’t in very good condition after the rain with plenty of potholes, just what I expected. When I did stop on the way I found real beauty. The Canadian part of Top of the World Highway was seal-coated a few years earlier but most of its surface has reverted to gravel. The going was slow and I made sure to slow down for oncoming traffic. 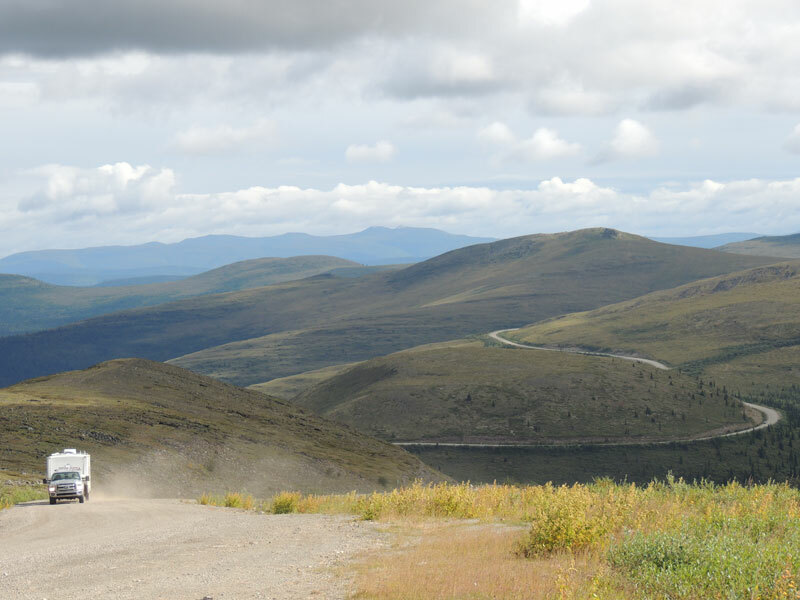 My experience from gravel travel on the Dempster Highway was still fresh. The highest point on Top of the World Highway is 1,376 m at the double-ended rest area with an excellent view of the Customs buildings. I didn’t see many cars on the road and was sure glad when I arrived at the border crossing. The Little Gold/Poker Creek border crossing from Alaska to the Yukon is the northernmost international border crossing in North America, in the middle of nowhere. The customs official was very friendly and wished me a safe journey…I wondered why. Customs is NOT open 24 hours. Make sure you arrive before 8 pm Yukon time. The Top of the World Highway remains open until the snow falls, but customs closes in the middle of September. The arrival of snow closes the road for winter. After it’s closed you can’t cross the border. If you are adventurous you still can drive to Forty Mile and the old town of Clinton Creek. I have this on my list for my next northern trip. Time zone change: Alaska time is 1 hour earlier than Pacific time. Allow plenty of time for this drive. This is a narrow windy gravel road with some steep grades and potholes. Keep your speed down with your headlights on and enjoy the scenery. Driving time Westbound to the border (106 km) is suppose to take around 2 hours, but can be much longer, depending on the weather. It took me double the time. 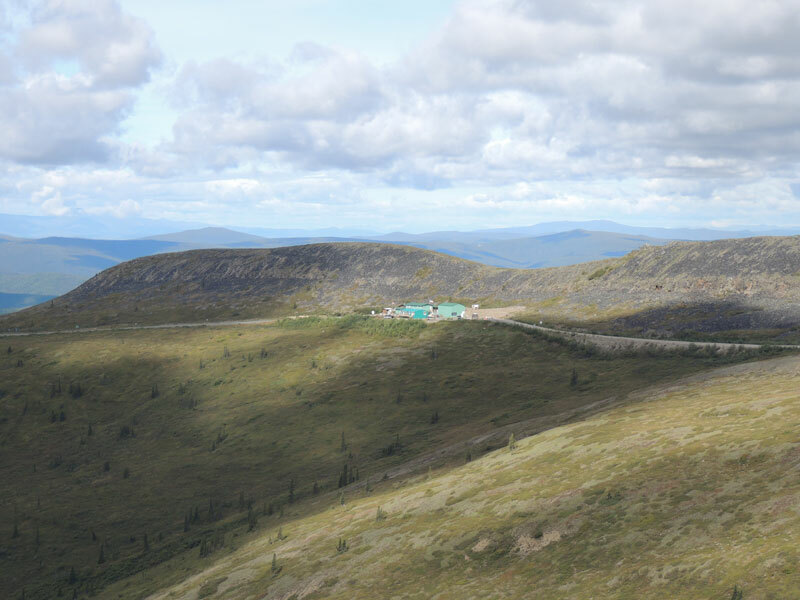 The Taylor Highway is a continuation of the Top Of The World Highway taking you through gold mining history. 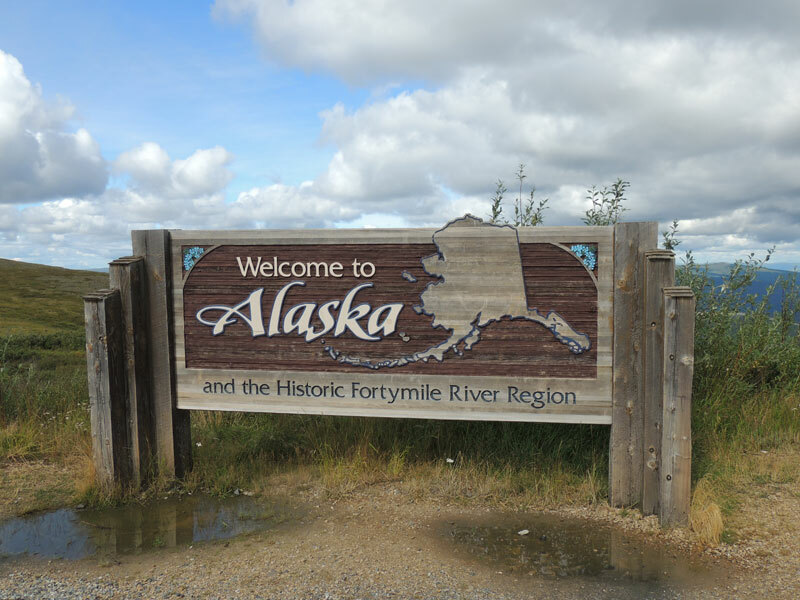 Prospectors searched for gold in the Fortymile region well before the famous Klondike stampede of 1897. Once you pass through Customs into the US you are on the Boundary Spur Road, an excellent paved road. Wow, I was so surprised and could hardly believe it. I soon found out that the pavement only lasts about 13 miles. After that, the road deteriorates to a narrow, winding gravel road with hairpin curves and with little or no shoulder. The condition of the road depends on weather and maintenance and can range anywhere from good to awful. The Taylor Highway is open seasonally from April to mid-October. Wade Junction is the first junction you get to. Keep left for Chicken or right on Taylor Highway for a detour to Eagle. The road from Jack Wade Junction to Chicken is gravel and can be a challenge. Give yourself plenty of time to reach your destination. The 65 mile Taylor Highway from Wade Junction to Eagle is similar to the highway between Jack Wade Junction and Chicken: Narrow, winding, gravel and steep drop-offs. The road to Eagle is not recommended for large RVs and big rigs. Also, keep in mind that there are very limited services and facilities available along the road to Eagle. I didn’t meet any other vehicles on the stretch to Chicken and started to worry whether I was on the right track. Fortunately, a cyclist came along and I waved him down. Dutch Nationality he said, and that it was only another 10 km to Chicken. Finally, reaching Chicken was such a relief and I was ready for a break. 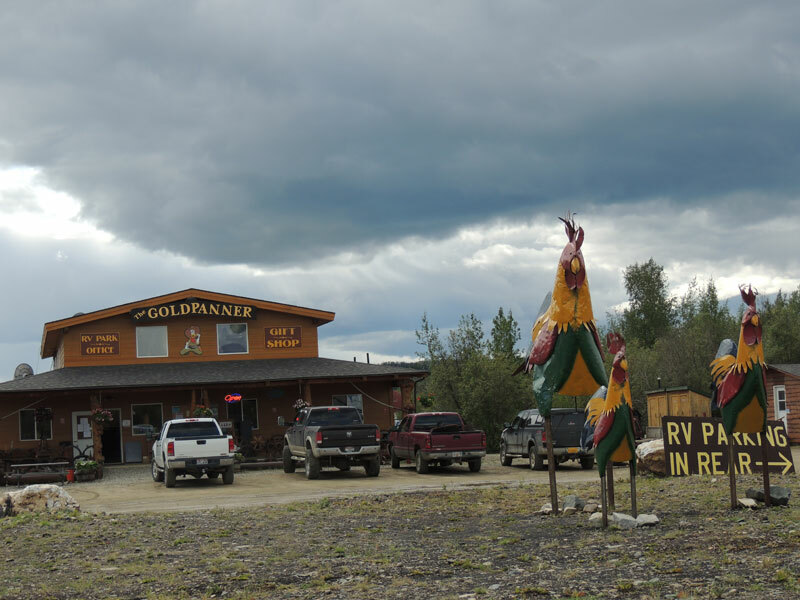 Chicken is a tiny community with a couple of gift shops, a saloon, campground, Coffee Shop and – WiFi! Chicken is a good place to stay over as there is a lot to see and do in this historic community. 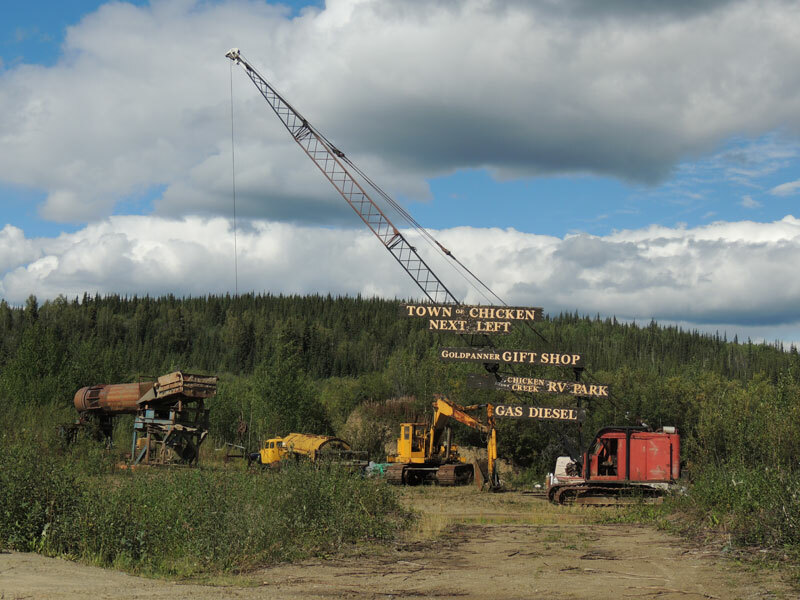 Chicken’s name comes from the early gold miners. As the town grew during the gold rush, the need for a post office meant that residents had to decide on a name for the town. Many wanted to call the town “ptarmigan,” after the large population of this species of bird that lives in the area. But no one could agree on the spelling. So the town of Chicken got its name! The road is paved/patched from Chicken to Tetlin Junction and was in pretty good condition. How you will experience the Taylor Highway is mostly based on your type of vehicle and the weather at the time of your trip. 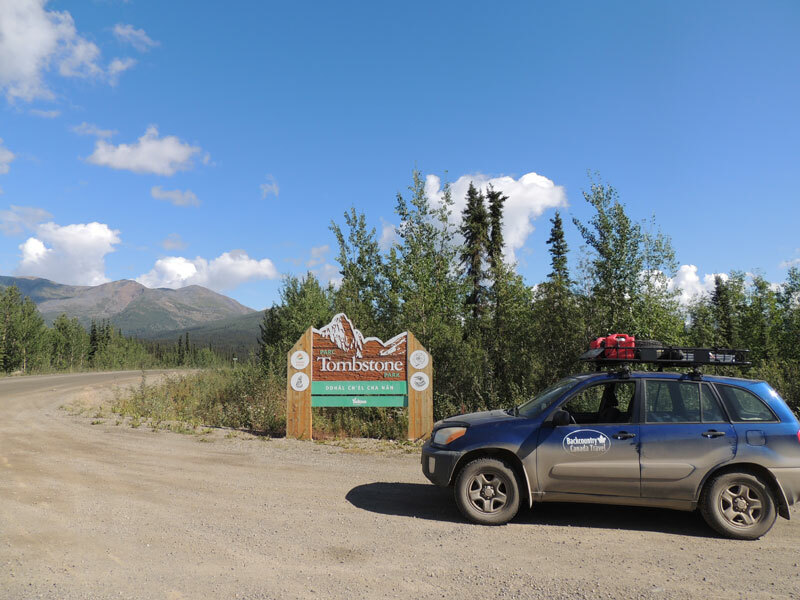 I didn’t have any flat tires or new windshield chips; probably because I’m a cautious gravel travel driver and learned my lesson driving the Dempster Highway. The Taylor Highway is often referred to as the stepping stone to the Dempster. I first drove the Dempster, which is another experience altogether. Do not trespass on any mining claims. If you do the side trip to Eagle, check your spare tire and make sure you have all your changing equipment if you get a flat. Go slow when passing oncoming traffic. The road is named after Robert Campbell, the first white man to explore the Yukon. Most travellers don’t come this way. Those who do might find the drive as one of the highlights of their trip. The Campbell Highway is an all-weather road. The road leads 583 km northwest from Watson Lake to the junction with the Klondike Highway just north of Carmacks. The Campbell Highway is both gravel and pavement with constant road improvements going on. The road can be rough and slippery in winter. The distance between Watson Lake and Ross River is 363 km. The Campbell Highway is a narrow winding gravel road with very little traffic. There are no services between Watson Lake and Ross River. 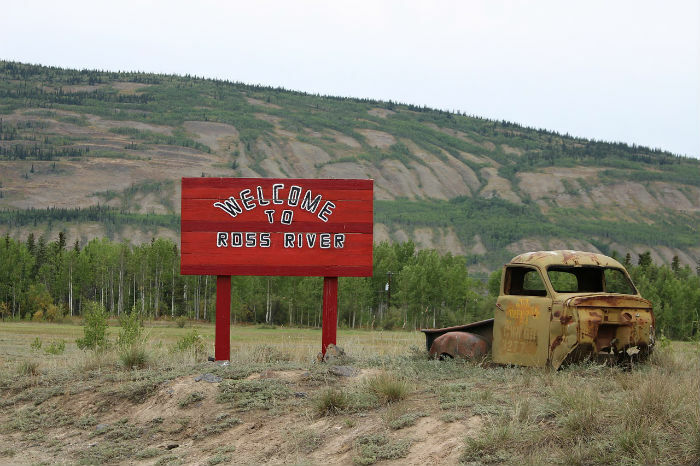 Ross River is home to the Kaska First Nation and a supply centre for the local mining industry. You will find campgrounds and hotels in this town. The 220 km stretch of the Campbell between Ross River and the Klondike Highway junction, is mostly paved and in fairly good condition. This part of the road is more heavily travelled. Gas is available in Watson Lake, Ross River, Faro and Carmacks. Watch out for black bears on this road and enjoy some lake scenery. This is a wilderness drive on a lonely Highway. Check current road conditions in Watson Lake at the visitor centre. Keep to the right on corners and hills. Be prepared for a rough road in construction and watch out for mining areas. Consider a side trip to Faro. The South Canal Road stretches 230 km from Johnson’s Crossing on the Alaska Highway to Ross River on the Campbell Highway with no services along the road. Canol is short for Canadian Oil. The road parallels the route of the short-lived oil pipeline from Norman Wells, Northwest Territories to Johnson’s Crossing in the Yukon. In 1943 the American army together with contractors built the Canol Road as a supply road. The use of the pipeline has long gone but most of the road remains. The old wrecks along the way remind you of times gone by. 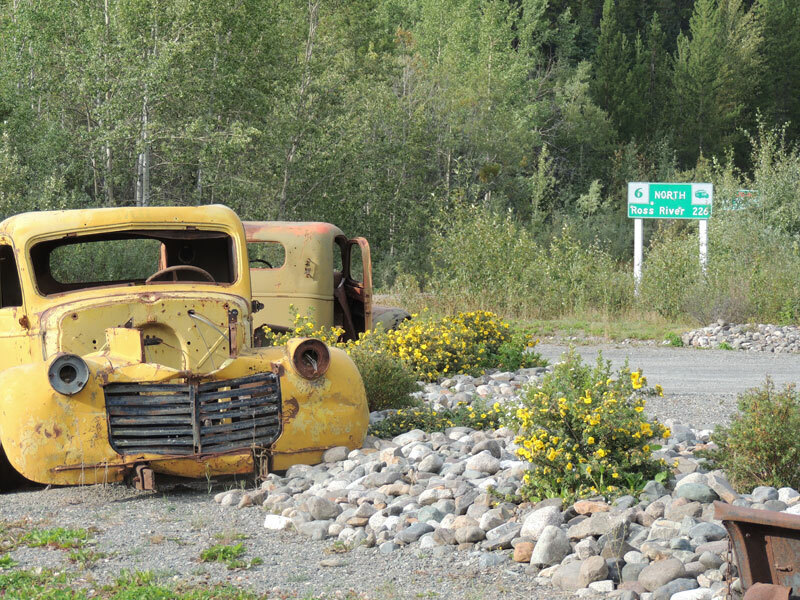 During summer the road gives you access to the wilderness of the south-central Yukon. It follows ridges and often takes you above the tree line providing amazing views. 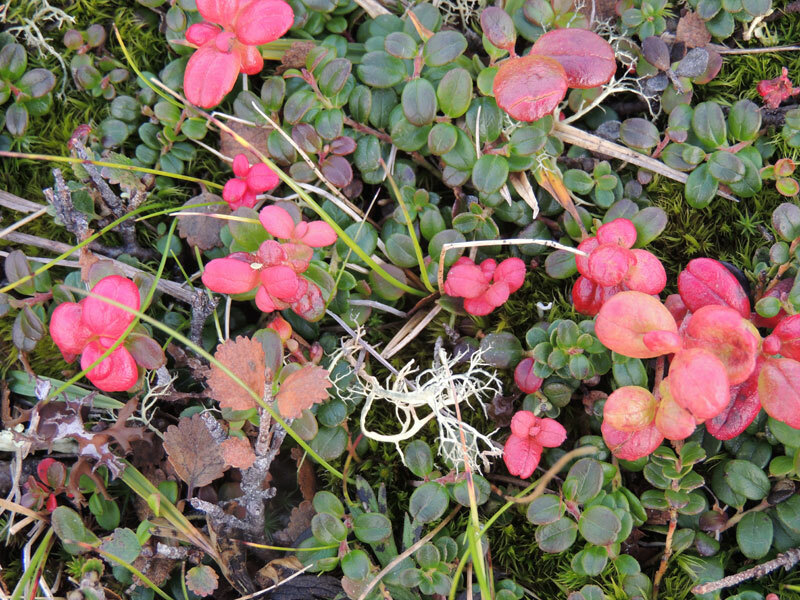 You travel through the Pelly Mountain region through boreal forests and alpine tundra. The area is the traditional territory of the Kaska and interior Tlingit First Nations. Camping is available at Quiet Lake Campground at 77 km. The South Canol Road is narrow and winding with rough sections. Occasionally the road closes due to washouts. In good weather and perfect conditions, it will take you about 4 hours one way. Inquire about road conditions before heading out. The Canol Road is not recommended for large RVs or trailers. The Canol Road is not recommended for any vehicle in wet weather. 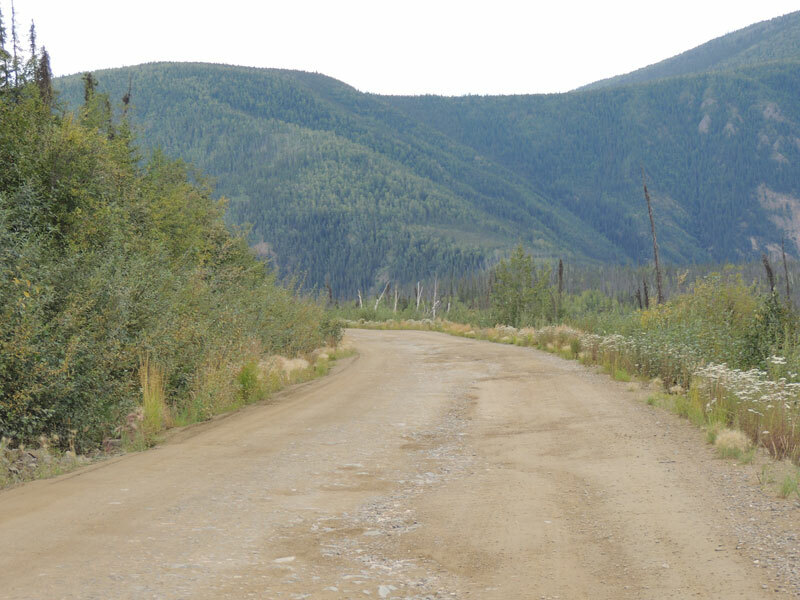 The 232 km North Canol Road is also a very winding, narrow rough road with possible washouts and no services. Inquire about the condition of the North Canol road in Ross River. The North Canol Road ends at the Yukon / Northwest Territory border, where you should turn around. 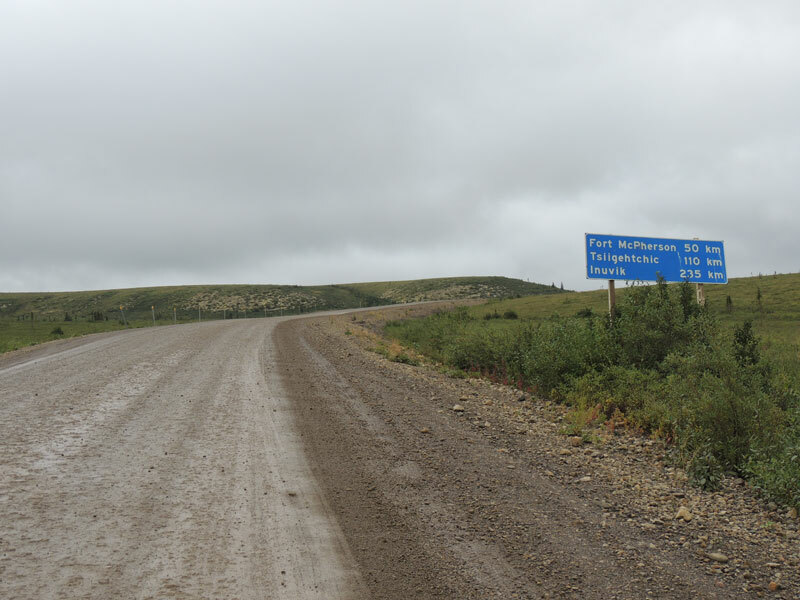 The distance from the border to Norman Wells it is 372 km unusable road and not suitable for any vehicle. This part is known as the Canol Heritage Trail which was designated by Northwest Territories government. None of the Canol roads is recommended for tourist traffic! Have you travelled any of the Gravel Highways? Let me know about your experience with a comment below. Enjoyed this article? Sign up for my Newsletter and follow me on Facebook and get notified of new posts. 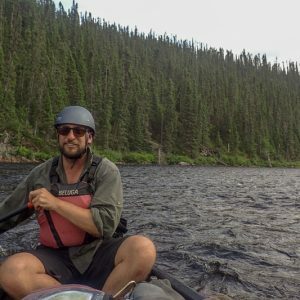 Travelled the dempster twice and would do it again amy time?also the south canol is worth visiting…hope to get to the north canol in the coming years?